Our family has a cookie tradition. We bake the same ones each year, and to us they signify the holiday season. in case you are looking for something special. Don't let the coconut fool you. I don't like coconut, yet I looovvvee these cookies! In a large bowl, with a mixer on medium speed, beat 1 ½ cups butter, sugar, orange peel and Vanilla until smooth. Shape dough into 1 inch balls and place about 2 inches apart on a buttered 12x15inch baking sheet. Bake at 350 degrees until cookie edges just begin to brown, about 8-11 minutes. A shorter cooking time will make chewier cookies, a longer baking time will yield a crispier cookie. Let cool 5 minutes. This recipe was developed by Nancy Jamison, Woodside California. I believe I found this years ago in a Sunset magazine (not sure though…). Almost too pretty to eat......awwww, why not!!! Here is the real recipe that I submitted to Sunset. They changed it, taking out half the salt, which was meager to begin with, but needed to blend the flavors. They took the orange oil out saying it was hard to find. And they took out the shortening. But I argued with them saying that most people don't know how to measure flour. Oh well. I baked their version of my recipe and mine side by side and had 11 people blind taste them and everyone liked my original better. So I give it to everyone. I'm glad you like them. I still do. I'm having a cookie party today and they are one batch of many I baked. In a mixer beat butter, shortening, sugar, orange peel, orange and vanilla extracts until light and fluffy. Meanwhile combine flour, salt, soda and baking powder. At low speed mix in flour until blended. Add cranberries and coconut and mix until blended. Roll into 1 inch balls and place on ungreased cookie sheet. Bake 8-10 minutes at 350 degrees until just barely turning brown. If you overbake they will be crunchy. Watch carefully. Cool on cookie sheet for at least 5 minutes then remove to rack to cool completely. oh how sweeeeeeeeeeet are your lovely cookies Terri!!! I start my baking Monday!!! we just made our Gingerbread house today and had a blast!!!! Nancy, how in the world did you find your recipe on my blog, I only just posted it last night?!!! I have tried to e-mail you back but can not find where to contact you. We love your recipe and I will definitely try your original recipe! Thank you for the years of happy cookie making you gave us! Try these cookies, they are always a favorite of guests. I have always wanted to make a gingerbread house, I hope you post a pic, I will go look on your blog. Thank you Terri for sharing,great blog. Oh how yummy good !!! At the risk of sounding egotistical, I have a Google alert set to my name because I'm an industry analyst and I like to see if my blogs or articles show up in Google alerts. I have a web site at www.jamison-consulting.com and you can get to me through it. Its interesting because not only does it pick up stuff about me, it also shows me all the other Nancy Jamisons out there, which can be very amusing. Cookies....what could be better? Except YOU sharing YOUR recipe with us. How wonderful...I'll be making these soon. Dave is a huge coconut fan, so he'll get the majority of them! Happy Holidays to you and your family. And your blog looks wonderful! The cookies look great! Your blog looks very festive and seasonal too. Terri...these sound yum, yum, yummy! I make a cranberry crunch that uses coconut too...and it tastes so good. I'll have to try these. Maybe I'll get to bake some cookies sometime this week and share. The Blog looks very festive and bright. Great job getting us all in the holiday spirit! Enjoy the holidays and having your family near. Pretty cookies, and your blog is gorgeous! 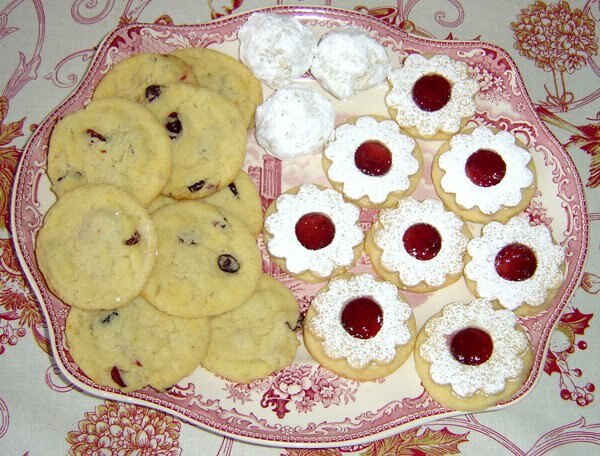 I like the sound of the cookies, I may have to try these sometime, thank you for sharing your recipe!!! Oh my don't these look yummy! Thanks for sharing the recipe as well. Have a wonderful Christmas. Yum! These look gorgeous - I'll give these a try I love cranberries!